The southernmost landscape-connecting unit in the Ocala to Osceola (O2O) corridor is a Florida Forever BOT project known as the Etoniah/Cross Florida Greenway. The Etoniah/Cross Florida Greenway project consists of a large tract that extends north from the existing Cross Florida Greenway to Clay County, and four smaller tracts designed to fill in gaps in state ownership along the Greenway. Though partially logged and planted in pine, the large expanse of flatwoods, sandhills and scrub in central Putnam County is important for the survival of many kinds of wildlife and plants. The Greenway is a unique strip of land for recreation and conservation that makes a cross-section of the peninsula from the Withlacoochee River to the St. Johns River. James describes the Etoniah/ Cross Florida Greenway as “upland-type habitat, with a few scattered hammocks,” all of which rely upon Etoniah Creek. – James Valentine. The Etoniah/Cross Florida Greenway project is important to the survival of rare species clinging to the rare habitat found on the site. There is high-quality sandhill habitat, and a unique white-cedar swamp along Deep Creek. 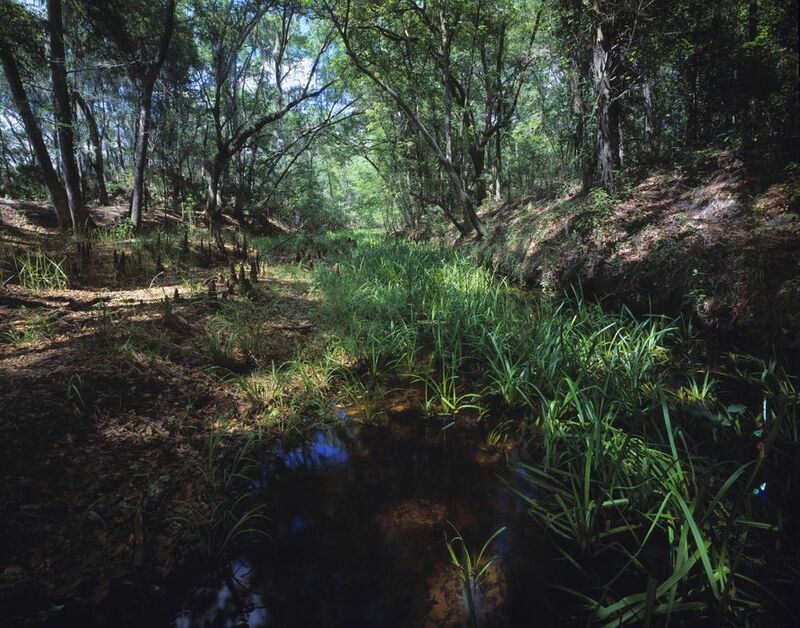 Near Etoniah Creek there are patches of very high quality scrub, harboring at least a dozen rare species including fox squirrel, gopher tortoise, indigo and pine snake, rare crayfish, and seven rare plants. This is the only known site for the federally-listed Etoniah rosemary. In addition, completing this connector between Ocala National Forest and Camp Blanding Joint Military Training Center to the north is very important to the survival of the black bear in northeast Florida. The smaller tracts include high-quality floodplain swamps along the Ocklawaha River; mixed forest land near U.S. 441 south of Ocala; and Inglis Island, disturbed pinelands between the old Cross Florida Barge Canal and the Withlacoochee River. In total, the project area is 93,259 acres, of which 26,957 acres are currently protected. It includes many acres of pine plantation and cut-over flatwoods, but these habitats will generate revenue through timber sales, and can gradually be restored to native habitat. The large size, restorable pine plantations, and diversity of the Etoniah Creek portion of the project make it highly desirable for management as a state forest. The second phase, the Cross Florida Greenway State Recreation and Conservation Area, includes scenic portions of rivers, lakes, wetlands and uplands. It is also near or contiguous with many other state-owned lands. The Etoniah/ Cross Florida Greenway project will conserve land in Putnam County as well as fill in gaps in the Greenway, providing an expanded recreational map through both phases. Currently protected areas within the project include the SJRWMD-managed Rice Creek Conservation Area, a rich bottomland forest with cypress trees among the largest in the state. Hikers in Rice Creek make use of a well-built elevated walkway put in place by trail managers on the Florida National Scenic Trail (FNST). The FNST crosses State Road 100 and eventually runs through Etoniah Creek State Forest, the other piece of existing conservation land within this project. So the completion of the Putnam County portion will be of benefit to FNST hikers in the future. It will ensure that wildlife such as the Florida black bear and scrub jays and plants such as the Etoniah rosemary will have areas in which to live. And it will provide recreation for the public ranging from long-distance hiking trails to fishing, camping and hunting.